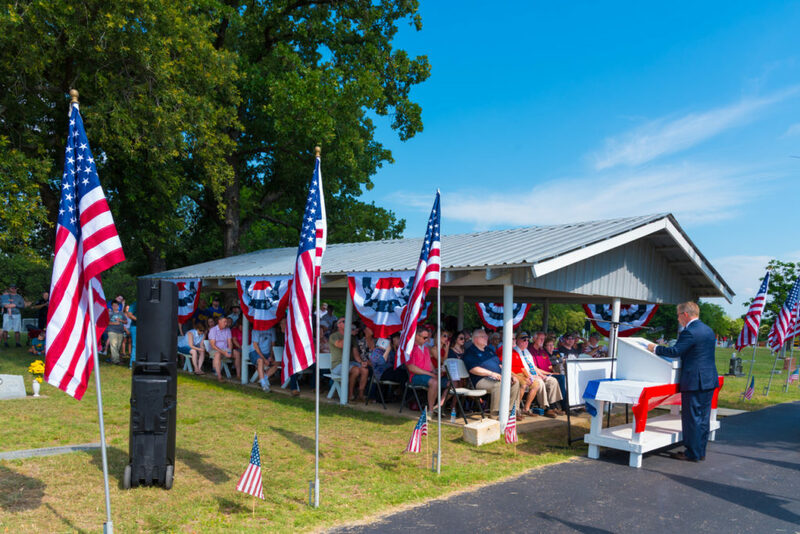 Yesterday (May 28, 2018) I had the privilege to speak at the Town of Trophy Club‘s Memorial Day Service held at the historic Medlin Cemetery. Below is the text of my remarks. Much appreciation to the Town, Mayor Sanders, Jim Parrow, Metroport Veterans Association, Metroport Rotary, the Girl Scouts, the Stars & Stripes Committee and the TC Police Department and TC Police Explorers. Special thanks to Gold Star father Terry Burgess and WWII veteran Fiske Hanley II for personalizing the day. Good morning and thank you for being here. The indications are very strong that we shall move in a few days, perhaps tomorrow. Lest I shall not be able to write you again, I feel impelled to write a few lines that may fall under your eye when I’m no more. I have no misgivings about or lack of confidence in the cause in which I am engaged and my courage does not halt or falter. I know how American Civilization now leans upon the triumph of the government and how great a debt we owe to those who went before us through the blood and suffering of the revolution. And I am willing, perfectly willing, to lay down all my joys in this life to help maintain this government and to pay that debt. Sarah, my love for you is deathless. It seems to bind me with mighty cables that nothing but omnipotence can break. And yet, my love of country covers over me like a strong wind and bears me irresistibly with all those chains to the battlefield. The memory of all the blissful moments I’ve enjoyed with you come crowding over me and I feel most deeply grateful to God and you that I’ve enjoyed them for so long. And how hard it is for me to give them up and burn to ashes the hopes of future years, when God willing we might still have lived and loved together and see our boys grown up to honorable manhood around us. If I do not return, my dear Sarah, never forget how much I loved you nor that when my last breath escapes me on the battlefield, it will whisper your name. Forgive my many faults and the many pains I have caused you. How thoughtless, how foolish I have sometimes been. But oh Sarah, if the dead can come back to this earth and flit unseen around those they love, I shall always be with you in brightest day and the darkest night — always, always. And when the soft breeze fans your cheek, it shall be my breath or the cool air on your throbbing temple, it shall be my spirit passing by. Sarah, do not morn me dead, think I am gone and wait for me, for we shall meet again. The reason we mark this day is to reinforce the values and beliefs of our nation and to remind us of the price that has been paid, lest we forget. I think Major Ballou’s letter captures that perfectly. Today is not a day to thank a veteran for his or her service. Today is about those who paid the ultimate price. Those of us who served with them remember their faces, their voices, their walk. It is said a warrior never truly dies until the day his name is said no more. Of the fifteen men I served with who died while serving this nation, I want to say the name of Lieutenant Colonel Kenneth W. Stauss. Ken commanded the famed 1st Ranger Battalion. He was an Olympic level athlete, he had a wicked sense of humor, he was rarely seen without a dip of Copenhagen in his lip. He was a gifted leader, a husband, a father, a friend. He died in a special operations helicopter crash on 29 October 1992. I wear his name on my wrist and I will never forget. We are better for having known them, and we are poorer at their loss. This country remains free. Let us take a measure of comfort in the fact that the loss of these men have helped make that possible. The men I served with would not want us to cry for their loss today. They would rather we burn some steaks, crack some cold beverages, and say their names and tell stories about their exploits. It’s OK to enjoy this day – it’s been bought and paid for and given to you to do with as you wish. Thank you for choosing to be here to remember and honor them today. You will hear from two men today, one who lost comrades in the South Pacific, one who lost his son in Afghanistan. During WWI, families displayed blue stars in the windows of their homes, one star for each family member serving overseas. When that family member died, the family took down the blue star and replaced it with a gold star. A Gold Star family member should be the most revered among our society, for they gave a son, daughter, husband, wife in sacrifice for our freedom. It is our privilege today to have a Gold Star father speak to us. Thank you for being here to honor and remember those who have given everything to ensure we are free. God bless them, God bless and comfort their families and friends, God bless the United States of America. The second Saturday each month the Metroport Veterans Association holds an informal breakfast at Meat U Anywhere BBQ in Trophy Club Texas. Please join us! Karl Monger is a former Army officer who served in the 9th Infantry Division, the 25th Infantry Division and the 1st Ranger Battalion. He is the executive director of GallantFew, Inc., a 501(c)3 nonprofit. Karl – well said; thoughtful, reflective and sincere. Perfect tone for an important day.